Hotel Harbour View Residency Cochin is regarded as the ideal choice for corporate guests and leisure travelers as it bears an easy accessibility to all the business and shopping centers in the city. This three-star hotel offers elegant decorations and exotic ambience and thus makes a stay, in this hotel, a truly memorable experience. With an array of facilities and services that are provided in this hotel, the guests who stay here are never disappointed. Harbor View Residency houses 53 finely decorated and exquisitely furnished suites and rooms that merge the complexity of a luxurious stay with the elegance of a comfortable one. 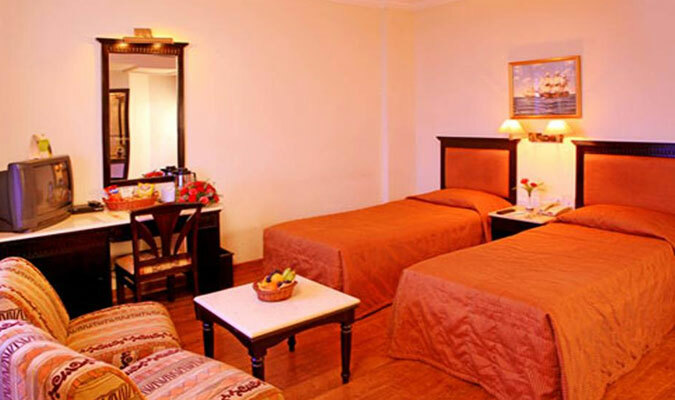 The rooms are very stylish and meticulously designed with aim to provide the best possible stay to the guests. All the rooms are installed with modern facilities with special features including exceptional furnishings, exquisite room service and laundry facilities. The Hotel rooms are divided into categories comprising of 23 standard rooms, 23 Deluxe Rooms, 5 executive rooms and 2 Suites. Two Trees: This is a multi-cuisine restaurant, spread over a large area and is opulent in style serving an array of mouthwatering multi-cuisine delicacies, especially famous for authentic Kerala cuisine. The coffee shop: For a quick bite along with coffee, the coffee ship in the hotel is perfect. Some of the favorites here are hamburgers and Masala Dosa. Coktayle Lounge Bar:Lift your spirits up with numerous brands of liquors.